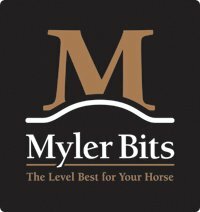 The creators of the Myler Bits, Ron, Dale and Bob Myler, offer a phylosophy behind every Myler bit; the bit is a communication tool between horse and rider. To effectively communicate with a horse, the rider needs a bit which allows the horse to be relaxed. The Myler bitting system is based on the concept of tongue relief. The most common traditional bit, the jointed mouthpiece, applies constant pressure by collapsing on the tongue and inhibiting the horse's ability to swallow. If the horse can't swallow, he can't move forward relaxed. The unique design of Myler Bits offer varying degrees of tongue relief for the horse depending on the level of training and disposition. Resistance is the horse's way of communicating discomfort. A horse may demonstrate resistance through one or more behaviors that are constantly repeated in relation to the bit. Recognizing the signs of resistance is critical to knowing when there is a problem. There may be medical or dental reasons underlying the behavior; eliminate these before re-bitting. Each Myler Bit is designed to use select pressure points for the best communication at each level. Myler mouthpieces are categorized by Myler Level 1, 2, 2-3, or 3. Each level allows the horse more tongue relief. Selecting the Right Bit (factors to consider). Myler Bits work as a system. Every horse and rider combination has specific needs and therefore require the proper bit. As the needs of horse and rider change over time and progress, it may become necessary to upgrade to a different bit, or downgrade depending upon the level of your horse’s training. In order to properly bit your horse it is essential to consider all of the following factors. Knowing the equine mouth is crucial to proper bitting, look inside. How is your horse's dental health? What do the bars and palate reveal? How thick and wide is that sensitive muscle, the tongue, where pressure and relief give the bit its main means of control? Though not part of the mouth, the chin and poll (located at the second vertebrae) both receive pressure from the bits. The chin, or curb, is affected by the bit's curb strap: the poll receives downward pressure through the headstall. Weigh your horse's level of training and the rider's level of skill. -Riding in a Level 1 mouthpiece and showing resistance. -Riding in a level 2 mouthpiece and showing resistance. Are you a beginner, intermediate or advanced rider? How are your hands? If you are building basic skills and/or have overactive hands, be mindful of bits which send too quick of a signal, including long shanks and/or straight shanks. • Feature curved mouthpiece that allows horse to swallow. • Feature Pinch & Restrict with Release. • Feature curved mouthpiece with tongue relief. • Use more bar pressure relative to tongue pressure, with mouthpiece rolling onto, and sometimes collapsing into, the bars. • May feature hooks, and apply curb, palate and/or poll pressure. • May offer Independent Side Movement™. -Curves to allow more room for the tongue, protects the lips and bars from being pinched. -Options with and without Independent Side Motion. • Use mostly bar pressure, rolling downward on the bars. • Address various pressure points to take the horse as soft as possible; may also use tongue, curb, poll and/or palate pressure. Myler mouthpieces have a distinctive curve. The curve creates more room for the tongue to pass under the bit so the horse can swallow more freely as opposed to a bit that goes straight across the mouth. Many Myler bits have a barrel in the center of the mouthpiece that acts as a bushing, allowing each side of the bit to move independently of the other. When the rider engages one fixed rein using a Myler bit with independent Side Movement, the rider lifts only one side of the bit, giving a very clear, precise signal to the horse. Myler snaffle cheeks have been modified with a unique feature called "hooks". The hooks are actually slots (English dee or eggbutt) or rings (western dee) that keep the bridle fixed in place and create 2 rein positions. If the rider attaches the reins directly to the ring instead of the rein hook, it creates a standard rein action. If the rider attaches the reins to the rein hook or ring, the rider can use the rein to lift the cheek and use the Independent Side Movement feature of the mouthpiece. The ratio of 'shank' to the 'purchase' remains 1:! so there is little to no increase in leverage or force applied to the mouth. The English dee and eggbutt additionally offer a hole on the top of each cheek that allows the rider to attach a curb chain using quick links (not possible with the western dee with hooks). The independent swivel cheek is a patented Myler feature on a limited number of cheekpieces. Myler shanks are independent of the mouthpiece and the independent swivel cheek means that the purchase has a slight swivel to it so it can give a little against the horses' face as the bit moves below it. Currently this feature is found only on the Parelli shankbits and Myler hand made Western bits. Eventually the HBT and flat shanks will have this feature too. Almost all Myler mouthpieces are 7/16" thick. The Myler's chose 7/16" because it provides enough surface area over which to distribute pressure and fits comfortably in most horses' mouth. All Myler mouthpieces with Western style cheekpieces, combination bits and cradle bits are made of sweet iron with copper inlay. Sweet iron oxidizes when exposed to moisture releasing a sweet taste in to the horses' mouth. The mouthpiece will turn grey after a few uses. All Myler mouthpieces with English style cheekpieces are made of stainless steel with copper inlay ( with the exception of the loose ring, which offers mouthpieces in both stainless steel and sweet iron). The goal of Myler bits is to make your horse as comfortable in the mouth as possible. One simple step towards the goal is to make sure you have the correct size. bit. Always measure your horse before purchasing a bit, unless you have been using a Myler bit and are sure about the size. -Insert the dowel in your horses' mouth where the bit would normally sit. - Wait until the horse relaxes in his mouth and stops chewing the dowel. -Mark the dowel on each side of the face, where the lips end. -remove the dowel and measure between the 2 marks. The most common available size is 5" followed by 5 1/2" and 4 3/4". Choose the size nearest your measurement, but go up, not down, to make sure that the bit won't be too snug. If the bit fits properly, you should see at least 1/8" to 1/4" of bit on either side of your horses' mouth when the headstall is adjusted correctly and the bit is centered in the mouth. The cheekpiece should not sit snugly against the horses' face because it can cause rubbing or chaffing on the cheeks or lips. There should be some room between the cheekpiece and your horses' face. If the bit still looks too big or too small and you are confident you measured correctly, check the adjustment on your headstall. If the bit is sitting too high or too low this will affect how it fits in your horses' mouth. All horses have slightly different conformation. Although 5" has long been the "medium" of bitting, don't assume your horse has a 5" mouth. Fleshy lips, a narrow muzzle or a heavy muzzle can throw the sizing off.